How is Trump going to handle the rainbow wave? Queer candidates, including women and people of color, broke through barriers on Tuesday. Not only did Democrats take back control of the House of Representatives, but what’s being hailed as the “rainbow wave” arrived during Tuesday’s midterms with massive victories for LGBTQ people. The big takeaway is that 152 LGBTQ candidates endorsed by the LGBTQ Victory Fund won nationwide at federal, state, and local levels. Heading into the midterms there were seven states that had never elected an openly LGBTQ person to the state legislature, but after big gains on Tuesday, that number was narrowed to four, according to a release from Victory Fund. “The rainbow wave touched down in state capitals throughout the country on Election Day – with an astounding number of out LGBTQ candidates shattering long-standing political barriers and becoming historic firsts,” Annise Parker, president and CEO of Victory Fund, said in a statement. Among the big wins were Colorado’s Jared Polis — he became the first out gay man elected governor of any state, and Angie Craig of Minnesota and Chris Pappas of New Hampshire becoming their states’ first out candidates elected to Congress. 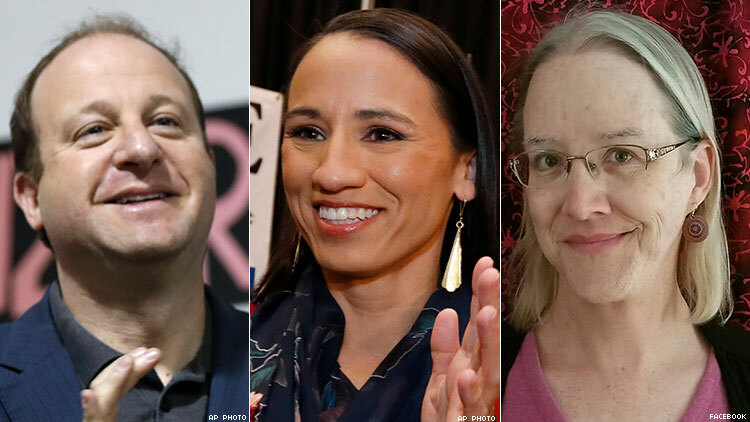 Another historic first was Kansas electing Sharice Davids, making her the first gay Native American woman elected to Congress. Meanwhile, trans representation in state legislatures tripled with Gerri Cannon and Lisa Bunker winning seats in the New Hampshire House of Representatives. The number of out candidates could still increase — many races remains too close to call, including that of Congressional candidate Katie Hil in California and Senate hopeful Kyrsten Sinema in Arizona. “This election is shaping up to be truly historic for LGBTQ candidates and, coupled with the change in leadership in the U.S. House of Representatives, shows a rejection of the hate-fueled politics of the Trump Administration that have heartlessly targeted LGBTQ people, women, immigrants, Muslims, and all vulnerable populations,” GLAAD president and CEO Sarah Kate Ellis said in a press release. Other firsts include Jennifer Webb becoming the first LGBTQ woman elected to the Florida state legislature, Gabriel Acevedo becoming the first gay man of Afro-Latino descent elected to the Maryland General Assembly, and Sonya Jaquez Lewis becoming the first LGBTQ Latina elected to the Colorado state legislature. Ellis indicated that the election results were in many ways a rebuke to the Trump administration.